What do I look for in a Functional Movement Screen score? A pre-participation medical physical is a lot more about the eyes, the ears, the nose and the throat than it is about movement. But what are the majority of injuries going to be? We’re going to have the few kids every summer who have a heart attack while playing football. That’s tragic. That’s also why we screen blood pressure and pulse. But, how many are going to blowout their knee so badly they never get to interact with sports again? Why aren’t we screening movement? How many will roll an ankle and return to sport before rehab goals are met. 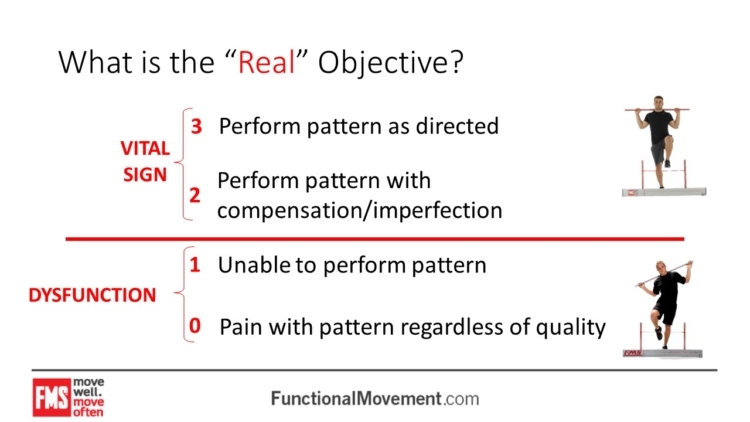 If the Functional Movement Screen had no scoring system whatsoever and all it did was identify people who have pain with movement (before movement is imposed through sport or activity), I still think it has great value. That 10-minute investment is worth it because my daughter might be one of the ones we catch. If the back of your knee hurts every time you go into a deep squat and my solution for that is “don’t go so deep,” the motor control is still distorted in that pattern, whether you bump up against your barrier of pain or not. We’ve got to look at movement health first. If you’ve got pain when you move, I don’t even know if you’re healthy. It doesn’t mean you’re not fit. You can appear fit and be very unhealthy. A positive impingement sign on your shoulder, pain in your low back on a prone press-up or ankle pain in a lunge . . .that’s a health problem until a medical professional tells me it’s not. I’m not trying to be over-cautious. I’m saying the disregard/lack of movement health is why we’ve got so many injuries. It’s even why exercise in itself is a risk factor now. Exercise shouldn’t be a risk factor. Competition and tactical operations should be risk factors because we can’t fully control those situations. The NFL has a 100% injury rate. Everybody who has that job gets hurt. We’re talking injury management. Knowing how somebody moves before they get injured is very important. We now look at cognition before exposure to concussion, but we don’t look at movement before the injury. First, there are people in pain who are telling you they’re ready to train. They’re getting ready to hurt your stats (and themselves) because pain is inconsistent and unpredictable. Second, setting a baseline we can revisit, when we know people are going into risky endeavors, is absolutely responsible. Now comes the area of debate. I said in the beginning of the Movement book “First move well, then move often.” It’s a very curt statement, but if I don’t define well, then all I did was create another problem without a solution. What we tried to say is in these patterns, if you get a 1 on the movement screen, it means you cannot complete the pattern at one bodyweight, so my hypothesis is that the medical physical is not getting the pain off the board. Pain is a huge and probably the biggest risk factor we’ve got. Next, a logical baseline makes more sense than the absence of a logical baseline. I tried to take a stand with the movement screen and said that with dysfunction, you are probably not going to respond well to performance enhancement measures and may break down quicker with respect to fatigue and/or even injury than those patterns. We get into 2, which is acceptable and 3, which is optimal. I think any good strength coach would tell you if somebody’s at a 2, I’m going to try to create the biggest buffer I can. I know what’s going to happen over a competitive season. It’s a war of attrition. We expect them to move. I think movement could be a good recovery biomarker. If somebody’s got an 18 on the movement screen and we beat on them for three days and it becomes a 12, this might not be a good day to go heavy even though the schedule says the guy should go heavy. I would love to start seeing information like heart rate variability and breathing efficiency on that movement counterpoint. Get the pain off board and set a responsible baseline. Even if we didn’t have a scoring system, I would still be a huge advocate for those two pieces of information. When people do research on the Functional Movement Screen, the one thing we tell them is to pull out the zeroes before you even do your study. Those people are already hurt. Letting them into the study doesn’t really help us see anything. Pulling the people who are already in pain out of the study and seeing if 1s break down quicker than everybody else, now that’s the study. I’m not saying the movement screen is beyond criticism, but a lot of the criticism has been from the assumption that a 3 is better than a 2. It’s not. It’s not at all. It only works one way. It works from the bottom. It doesn’t work from the top. When your eyes go across a FMS score sheet—0s. The next thing you’re looking for are 1s. The competitive difference between a 2 and 3 on a pattern in the FMS is probably best seen in different environments, whereas a zero or 1 is detrimental in any environment (when compared to those without a zero or 1). I can’t talk scoring without discussing the asymmetry issue. If we define a 1 on the movement screen as dysfunctional, a 2 as acceptable and a 3 as optimal, then there are three different ways we can have an asymmetry. We can have a 1-3 and a 1-2 or we can have a 2-3. We see a lot of throwing athletes with that 1-3 asymmetry. We start doing correctives and get them to a 2-3, but they never get a bit better because as long as their livelihood is asymmetrical movement, we’re going to see that asymmetry. Plus, we’ve got somebody who’s probably been throwing most of their life, so we’ve got some bony remodeling there. I don’t have as big an issue with an asymmetry (one side is acceptable, one side is optimal and both sides, by default, are acceptable) as I do when you’ve got a dysfunction. Once again, we don’t even have to debate asymmetry. If you’ve got a 1 somewhere whether it’s involved with an asymmetry like a left-right lunge or whether it’s just a one-arm push-up, you’ve got to look at that. Pull out the zeroes. They need further assessment. For 1s, don’t load the pattern. Make a valid attempt to try to correct the pattern before you load it. If you fix the 1, you may stabilize an asymmetry or at least move it into a safe range. If you make the 1 go away, you’re there. We look at athletes all the time who have left-right asymmetries. You give me a discus thrower, a javelin thrower or somebody who makes four left turns really fast, they’re going to have asymmetries. Here’s where we run into a problem in the United States. Athletics have always created subtle asymmetries, but in the US more than anywhere else, we put symmetrical loads on asymmetrical athletes. If you’re a sprinter and you’re from Jamaica, and if you’re extremely fast and you don’t feel like lifting, you don’t have to lift. It’s not really something a lot of other cultures are adamant about. If you’re naturally gifted, then everybody is very conservative in the things they introduce. When we see somebody with a left-right hip asymmetry (because they’re a hurdler) go deep in a squat, they’re going to shift. The question you’ve got to ask: Is this asymmetry an occupational hazard? Do I correct against it, but I don’t load into it? Because there are a lot of loads I can put on a hurdler that will never make them shift. Unknowingly, we symmetrically load asymmetries. If we see athletes break down with an asymmetry, it could be because of what we’re doing to it. However, if you’ve got a dysfunction on one side and optimal or acceptable on the other side, I attack it—not because it’s an asymmetry, but because it’s a dysfunction. I find that’s a cleaner way to teach it. It gives people less operational latitude. Address the 1s. On our very first two patterns, if you score a 1 in every test on the FMS, I’ll tell you to go for the Active Straight-Leg Raise first. It levels the pelvis and it changes quickly. The leg raise and shoulder mobility are the first two things we take off the table. The next thing is the rotary stability. That will check motor control. Next is the push-up. Everything off your feet takes priority, so if you’ve got a 1 on everything, even a 1 on the squat and a 1 on the lunge, I’ve got more of a chance to change those by working on your leg raise and shoulder mobility than I do a full frontal attack on the squat. There are bricks and mortar that go into that. When we first launched the movement screen, the deep squat was such an indicator of a poor score everywhere else we just said, “We’ll just fix the deep squat and all will be good.” We learned that you can’t take a full frontal attack on the deep squat because every other movement screen pattern can be seen within an overhead deep squat—every other pattern. Your hurdle step, your lunge, your push-up, your shoulder mobility and your leg raise, they’re all in there, so the deep squat is the sum of everything you’ve got. When we see a 3 on the deep squat, we’re getting ready to see a few more 3s, some really nice 2s. You might see a 1 on the push-up in the hypermobile person, but when you see a 1 on the deep squat, you’re getting ready to see 1s in other places too. Work that screen from the bottom up and you’ll literally save time. We’re really arguing over about 7.5 minutes to do the other tests, but once again, we’ve got other opportunities to provoke pain while also setting a full baseline. I still do the whole screen for the provocation and baseline value. Don’t take a partial baseline when you have an opportunity to take a full baseline because your own internal stats are going to actually tell you where your next best efficiency movement is. The rule here is to never assume anything; remain hyper-vigilant and always know as much as you can. When you look at the investment of time and the continuity, you’re always going to wonder what those other patterns were. It’s just better to know. That way, you can start seeing change. 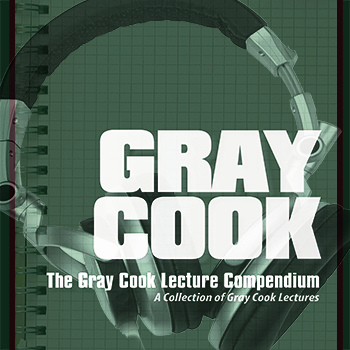 Interested in hearing more from Gray Cook on understanding and implementing the Functional Movement Screen?